Lourdes Sancerni joined Moore Ingram Johnson & Steele in 2013 and is currently a member of the firm’s Litigation Department. She is currently practicing primarily in the area of Workers’ Compensation Defense, out of the firm’s Central Florida office located in Orlando, Florida. Lourdes was born in Miami, Florida on July 2, 1976 and is proud of her Cuban heritage. She is bilingual and speaks fluent Spanish. She received her undergraduate degree at Florida International University in Miami, Florida with a Bachelor’s of Science Degree in Criminal Justice. While at Florida International University (FIU), she was the Vice-President of the FIU Chapter of Alpha Phi Sigma (National Criminal Justice Honor Society), and a Member of the Golden Key National Honor Society and of the National Leadership Honor Society, Omicron Delta Kappa. 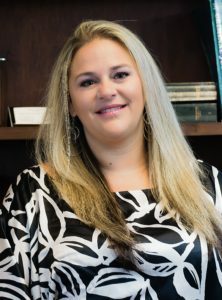 Following her graduation from FIU, Lourdes attended and received her Law Degree from the University of Florida in December of 2002 and became a proud Member of the Florida Bar in April, 2003. She graduated from UF with Honors and earned the Book Award for Trial Practice. She was a proud member of the Phi Delta Phi Honor Society, and Gainesville Inn of Court. Lourdes began her legal career representing Insurance Carriers, Adjusters, and Employers in the area of Workers Compensation Defense with a prominent Florida insurance defense firm and continues to devote her legal experience to defending Workers Compensation claims throughout the State of Florida. She is currently a member of the Workers Compensation section for the Florida Bar. Lourdes lives with her daughter Izabelle, and their English Bulldogs. She enjoys spending time with her family, watching her daughter play Volleyball, and enjoys attending and watching College Football games.